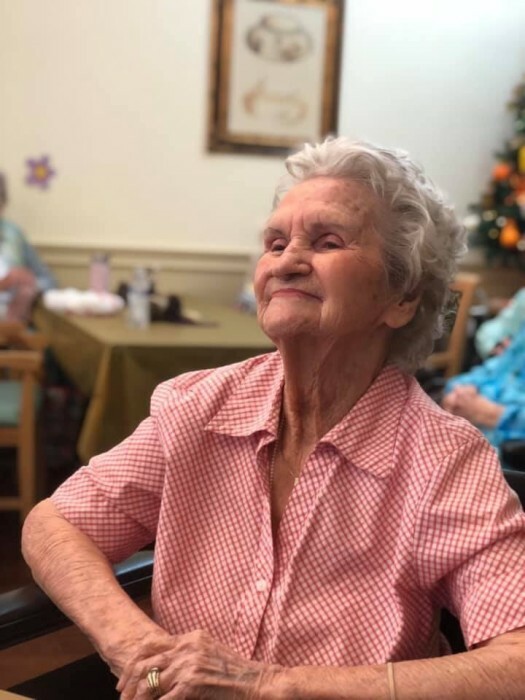 Ernestine Johnson Fincher 94, a lifelong resident of Waxahachie, passed away January 24, 2019. She was the 7th child of the 7th child. Ernestine and C.M. made Waxahachie their home for 78 years. Together they ran Fincher Plumbing for many years and were founding members of Water St. Baptist Chapel, later known as Water Street Baptist Church where she was a Sunday school teacher for many years. Ernestine was a homemaker, a cook, a baker, a seamstress, a quilter. She was famous for her Pound Cake and Dad’s favorite Chocolate Pie. You could always find one of her cakes on the “Cake Walk” during the Optimist Carnival on the square. Her main focus in life was her husband and her children. Later in life the loves of her life where her grandchildren and great grandchildren. She was preceeded in death by her husband Marshall Fincher and Parents Cyrus Franklin Johnson and Etta Pearl Harwell. She is survived by her children; Son Charles Steven Fincher of Waxahachie his children Todd Fincher Ryan Fincher and wife Carla, children Cayson and Chandler. Son Marshall Dale Fincher and wife Beth of Waxahachie son Mason Fincher and son Marshall. Daughter Marsha Kaye Fincher and husband Jerry Don Fox and their children Jason Graves, and children Charley, Keeley and Kaden, Allison Mandrell and husband Jerod and daughter Avery, Kia Hugghins and her husband Jordan, Colton, Brodie and Lily, as well as many nieces, nephews, cousins and friends. A Special Thanks to the employees and staff of Covenant Place in Waxahachie and Vitas Hospice Care. Friends and family are encouraged to gather for a time of visitation Tuesday, January 29, 2019 from 6 to 8 in the evening at Wayne Boze Funeral Home. A graveside service will be held Wednesday, January 30, 2019 at 10 o’clock in the morning at the Waxahachie City Cemetery. Following the burial, friends are invited to the Family Home place located at 108 Maledon.